An interview with François-Xavier Li from World of Swimrun and Swimrun France on his experience of the inaugural Love SwimRun Llanberis race. W: Hi Fix. You came in second in mixed, congratulations! We do short race reports that go beyond the stats and give people a feeling for different races to help swim-runners pick races best suited for them. So to kick-off on this theme, how was the race? Can you describe it? Fix: Thanks! The race takes place in in Snowdonia, North Wales, UK with the swim based in a Llyn Padarn, Llanberis. It is a small distance event with 12km run and 4km of swim with 4 sections for each discipline. The longest run is 8.2km and the longest swim is 1.4km. The long run includes a climb in disused quarry with a 300m elevation. So the course favours the swimmers. That played to our advantage! W: The race is in a new location in the UK, was it easy to get there? Fix: You probably need a car to access it comfortably. For UK citizens it is not difficult to get there. For international racers the best is probably to land in Liverpool or Manchester and drive down there. W: What do you think about the course? Fix: The course is simple and quite natural, with no difficulty in navigation. Although it is a short course, there is a bit of everything with some steep climbs, some technical downhill and some flat rolling terrain. W: You did well coming in second in mixed. Did the race go according to plan? Fix: We knew that swimming would be our strength, so we planned to capitalise on it. We swam the first leg at a good pace to put ourselves up front. Then the first part of the run section was flat and we did not put ourselves in the red zone. We applied the same tactic for the steep climbs where we walked and let some teams pass us. We thought that their level of effort was too high for us and that they would pay for it later. There isn’t that much difference between running and power walking on steep terrain. We ran much faster in the technical downhill. The second swim was against the wind and some small choppy waves. We worked hard to catch up rapidly the guys who passed us in the climb. We ran faster in the final flat section, and pushed again in the last longest swim where I believe we passed the third mixed team. The organisation offered gels in the middle of the swim (something I never seen elsewhere) but we skipped this feed station. Overall we produced a solid, consistent effort all along the race. Fix: Early on we passed in an old forest, climbing to Dolbadarn Castle, a 13th century tower, typical of the area. Another one was when we ran down in the forest we could glimpse at the lake lower down below. It was beautiful, but we had to keep our eyes on the roots and rocks! Finally the final swim goes through a mangrove like area, an eerie and surprising environment! W: We understand that it was possible to race solo which is normally not the case in many swimrun races, what are your thoughts on this? Fix: So in this race the option was solo or team. The split was in favour of teams. Solo started 5 minutes before and had to carry a buoy for safety. There was no conflict on the course between the two options, so at least in terms of compatibility, it was without issue. The debate is maybe about the ‘spirit’ of swimrun. Is it strictly a team event or can it be true to its roots and be done solo? This race was a short distance, largely orientated toward discovering the activity. For most people it was the first swimrun they had done. After talking to several solo competitors it was clear that they didn’t know how or where to find a partner for this race. Essentially, they would not have had the chance to try out swimrun if it was only a team event. It was also apparent that quite a few solo competitors ended up running in pairs or trio, sharing the experience, discovering what it is to race together. So on balance for short event, aimed mostly at beginners, the solo option will open the sport to more people, and that has to be a good thing for the sport. W: Is there something the race organisers, Love SwimRun, can develop for the future? Fix: For a first event, it was very well-managed and the organisers should be congratulated. One innovation they could introduce is to offer solo racers to pair together to form a team. This way people who do not have partner could still compete in teams. It was very nice that they helped Nicolas Dewalque from Belgium to find a partner for the race. Nicolas is a visually impaired athlete supported by the Challenge Athlete Foundation founded by Bob Babbitt, well known in the triathlon field. The organisers linked Nicolas up with Katy Nelson, a local athlete, who guided him through the race. I find this kind of initiative fantastic, demonstrating how inclusive our sport can be, and of course, I have a lot of respect for Nicolas and Katy. You you want to hear about how they got on read his race report here. 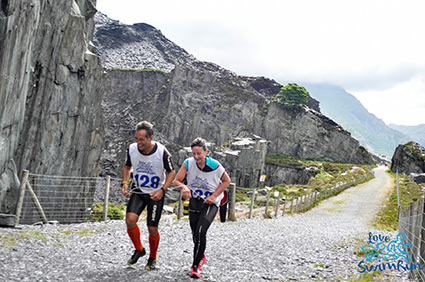 W: Finally any advice to those doing the Love SwimRun Llanberis race next year? Fix: Take some time to stay and discover the area, it is a stunning part of Wales and there is a lot to do if you enjoy the outdoors. You can see the scenery in the video below. W: …and what’s next for you in the swimrun calendar? Fix: I have raced a lot already this year, but the next race is Engadin in July, Aquatic Runner in September, and certainly one or two more races between October and November, but nothing decided yet. W: Great and thanks for your time! To find out more about Love SwimRun 2017 click here. Watch the official video of the race below!